No Man’s Sky continues its path of free updates years after release, and the latest brings a major overhaul for terrestrial exocraft vehicles. 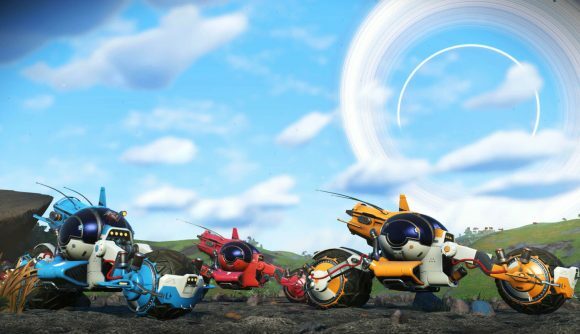 That includes the addition of the Pilgrim, a high-speed motorcycle that lets you tear around planetary surfaces on two wheels, and you can now customize the handling and look of your vehicles. You can pick up the Pilgrim Geobay blueprint as usual from the Blueprint Analyser. The whole vehicle summoning process has streamlined, too. A new Exocraft Summoning Station be built, which allows you to call up your exocraft with unlimited range anywhere on the planet – meaning you now only have to build Geobays once. Upgrade modules are now available for exocraft, giving you the chance to increase speed, boost, and other stats. These can be purchased with Nanites at the Exocraft Technician, assuming you’ve completed the appropriate quest chain. A separate new technology allows you to customize handling to prefer grip or drift. Vehicles also have bigger inventory sizes across the board. You can also get into visual customisation, altering colours, decals, and flame effects as you wish, with separate options for each element of the vehicle. Asymmetric nonsense rainbows? If that’s what you want, you’ve got it. The official patch notes detail further improvements, including fixes for multiplayer races and improved PC performance for tessellation. We’ve gotten new stuff like Quicksilver in other recent updates, and regular rotation of new events and content updates has helped to keep No Man’s Sky alive.